Outbound phone sales are one of the most effective tools you have at your disposal. In fact, a study of salespeople found that almost half of them believed that the telephone was their single most valuable tool. Given its incredible value, it makes sense that you need to dedicate resources to making their time spent on the phone as efficient as possible. A power dialer is the perfect tool to help you out. Power dialers automatically take control of your phone lists, calling them automatically and connecting anybody who answers to your eager sales team. 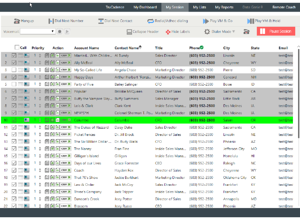 Notes and connections are automatically synced with your CRM system, such as Salesforce, which makes everything much easier to track. Outbound sales teams spend a great deal of time organizing their call lists, manually dialing, and tracking their progress. Power dialer software handles this automatically. Working off one or multiple call lists, your agents will automatically be connected to phone calls so that they spend less time dialing and more time selling. Progress is tracked automatically so they can dive right back in after lunch or even the very next day. The benefits of a local presence dialer are immediate. Customers are more likely to answer phone calls when they see a local number calling them instead of a toll-free or long-distance number. In fact, studies show that people are twice as likely to answer a local number as they are an out-of-state number and four times as likely to answer a local number as they are a toll-free number. With a power dialer fully integrated into Salesforce, you’ll be able to import and dial phone numbers automatically. No numbers will be missed or entered incorrectly and customer accounts will be updated automatically. This saves a great deal of time, and most importantly, ensures your data is accurate. Considering that faulty data costs businesses in the U.S. trillions of dollars every single year, this more than pays for itself. With Salesforce lead scoring, your prospects are automatically scored based on how valuable they’re likely to be to your company. Combined with power dialer software, this is one of the very best ways to increase sales. Your power dialer will automatically call the most valuable prospects first, ensuring that they don’t slip through the cracks. This improves your sales team’s efficiency and will drive better overall performance. Your sales manager will have more power than ever before with a power dialer. Monitoring Mode allows them to jump in and out of phones calls to review their sales team’s performance. When training, they can whisper directly to the rep to give them advice in the middle of a phone call. Beyond that, there are powerful reporting capabilities. Dashboards provide access to real-time analytics. In-depth reports can be viewed online or downloaded. With all of these tools and data at their hands, your managers will be able to assure quality control and optimize processes on the fly. With the click of a button, you’ll be able to record and leave voicemails to anybody who doesn’t answer their phone. You can even record separate voicemails for different customer lists to provide customized offers and information. With integration in Salesforce, this can live alongside your email and mobile messaging strategies, ensuring that you contact your prospects efficiently across multiple platforms. In order to enjoy the benefits of a power dialer, you must find the solution that works for you. ConnectLeader’s Personal Dialer is a cloud-based power dialer software that integrates quickly and easily with Salesforce. You’ll be able to better engage with your prospects and drive better performance in less than an hour. To talk to our team or schedule a demo, all you need to do is click here or give us a call at 800-955-5040. Why Do You Need Outbound Sales Email Automation Software?